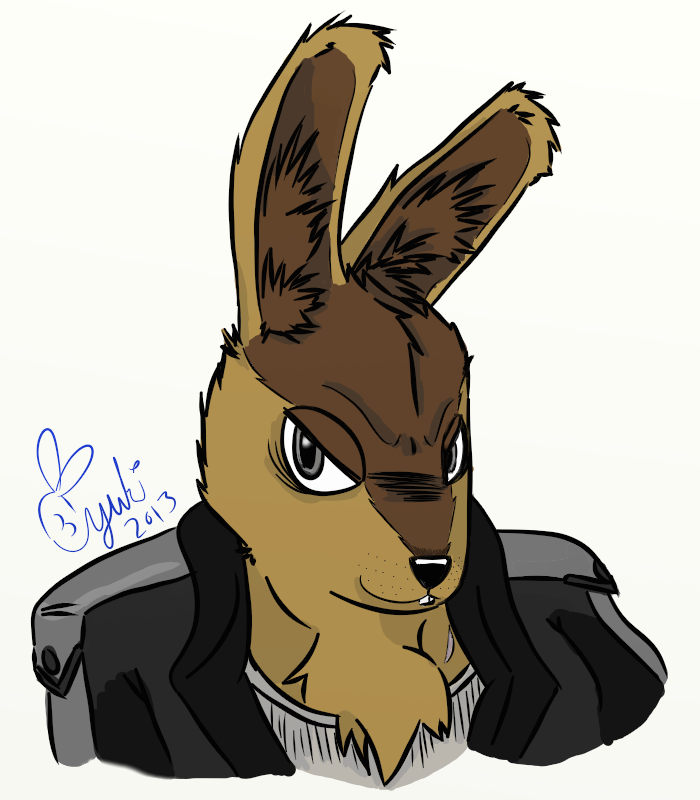 An awesome headshot of Ryland Garvan from my Starfox fanfic, drawn by xXShikaXYukiXx! She's doing commissions for GREAT prices you should check her out! Ryland is one of the antagonists in my Starfox fanfic. He's the leader of a mercenary team that has been hired to kidnap Fox McCloud, but kill the rest of the Starfox team. He used to be in the Cornerian Special Forces, but lost all but one of his squad during the attack on Corneria City in the Lylat Wars, due to the orders of a crooked, cowardly General, who used Garvan's squad as a distraction for the invading Venomian forces, to cover his own extraction from the city. When Garvan found out, and tried to have the General brought to justice, he was dishonorably discharged on false pretenses. He's had a hatred for the military ever since. Not that Garvan was the nicest guy before his discharge however. He gets a twisted thrill from fighting, and he joined the military purely because it allowed him to be involved in battle. He is especially fond of hand to hand combat, and is extremely lethal while unarmed. He sadistically toys with his opponents until he sees them realize that they are going to lose, at which point he finishes them with a 'coup de grace', a slow, painful stab to the heart, with his one keepsake from his time in the Cornerian Military, a knife he took from the body of a Venomian soldier he killed. Despite his lust for violence, Garvan has a pretty cheerful demeanor, seeming to be a cool guy to hang out with, conversational and charismatic, which makes it especially jarring when he suddenly takes on a more sinister attitude. He has no problem murdering people for money, and will take jobs from anyone except the Cornerian Military. In fact, he purposely take jobs that involve ATTACKING the Cornerian Military, because he enjoys killing them the most. The only people that Garvan considers friends are the ones on his team, especially Marley Istaqa, the only member of his special forces team who survived the Lylat Wars with him. Fox is not aware that Garvan is after him and his team, and has no idea of the extreme danger he is in! Check the story out if you are interested! Thanks lol! It's funny to me because the only reason I made him and his team, is because I didn't want to use Andross or Starwolf as the bad guys lol! But as I started thinking up ideas, I got REALLY into it lol! I wanted to use a species that wasn't often associated with villainy or violence, and since the only Hare in Starfox is Peppy, I figured I would make a direct opposite of him, a badass, dangerous hare that runs a ruthless merc team lol! Thanks again, you captured his personality PERFECTLY with your drawing!